The lumbosacral intumescens (intumescentia lumbosacralis) is an enlargement of the spinal cord from which arises the lumbosacral plexus. Pecular to birds, the dorsal part of the spinal cord in a well-defined area of the lumbosacral intumescens is incompletely fused, resulting in an interspace or rhomboidal sinus. 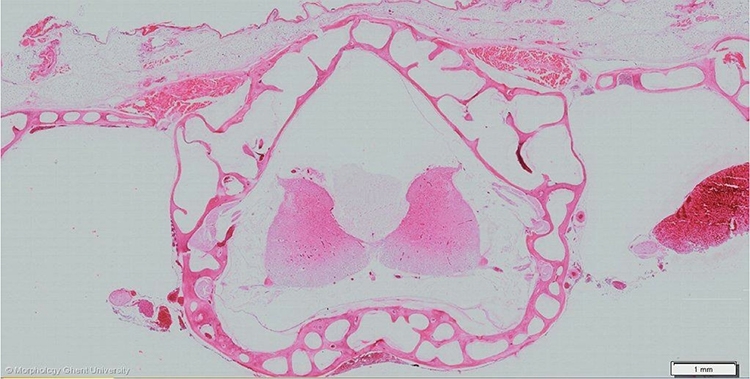 This sinus is filled by the gelatinous or glycogen body (corpus gelatinosum). In chickens, the glycogen body extends from S2 to S6. At the level of the glycogen body, the vertebral canal is widened.